Peptide (C)DAHASNSSDGLGLND, corresponding to amino acids residues 191-205 of rat DAT (Accession P23977). 2nd extracellular loop. Homology Mouse - 14/15 amino acid residues identical. Specificity Not recommended for use with human samples. 1-3. Anti-Dopamine Transporter (DAT) (extracellular) Antibody (#AMT-003), (1:200). 4-6. Anti-Dopamine Transporter (DAT) (extracellular) Antibody, preincubated with the control peptide antigen. Mouse coronal brain sections (1:200) (Hong, J. et al. (2015) Cell Death Dis. 6, e1832.). 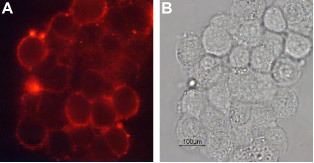 Cell surface detection of DAT in live intact rat pheochromocytoma PC12 cells. A. Cells stained with Anti-Dopamine Transporter (DAT) (extracellular) Antibody (#AMT-003), (1:100), followed by goat anti-rabbit-AlexaFluor- 594 secondary antibody (red). B. Live view of the cells. Robertson, S.D. et al. (2009) Mol. Neurobiol. 39, 73. Gainetdinov, R.R. (2008) Nauyn-Schiedeberg’s Arch. Pharmacol. 377, 301. Torres, G.E. and Amara, S.G. (2007) Curr. Opin. Neurobiol. 17, 304. Ciliax, B.J. et al. (1995) J. Neurosci. 15, 1714. Uhl, G.R. (2003) Mov. Disord. 18, S71. The Na+/Cl- transporter family, SLC6, includes DAT a monoamine transporter, important for regulating extracellular levels of dopamine. It does so by uptaking dopamine from the synaptic cleft via the co-transport of Na+ and Cl- down their electrochemical gradient1. The removal of dopamine by DAT remains the most important means to control the extracellular lifetime of the neurotransmitter, and notably the ending of dopaminergic neurotransmission2. Transporters for serotonin, norepinephrine, GABA and glycine also belong to this family3. These receptors have 12 transmembrane spanning domains and intracellular N- and C-terminal domains. DAT is also subjected to post translational modifications such phosphorylation, important for its regulation1. Also, it possesses a large extracellular domain which undergoes N-glycosylation, important for the proper targeting of the transporter to the plasma membrane1. 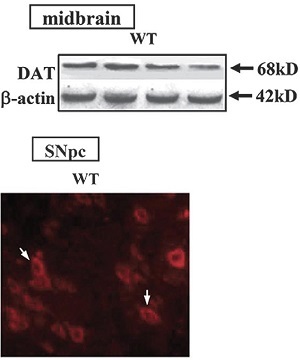 DAT is expressed in dopaminergic cell bodies and terminals and can therefore serve as a marker for these neurons4. DAT is also expressed in the retina, gastrointestinal tract, lung, kidney, pancreas and lymphocytes2. DAT plays an important role in movement as well as reward, learning and memory5. Its malfunction which leads to dopaminergic dysregulation has been associated with ADHD, schizophrenia, as well as Parkinson’s disease2. DAT is the main target for cocaine and amphetamine and methamphetamine psychostimulants, which mainly increase locomotor activities2. Expression of Dopamine Transporter in mouse brain.Western blot analysis of mouse midbrain lysates using Anti-Dopamine Transporter (DAT) (extracellular) Antibody (#AMT-003) (upper panel). DAT protein levels from mice exposed to different drugs are shown. Immunohistochemical staining of mouse brain sections (lower panel). DAT staining (red) in substantia nigra is detected in dopaminergic neurons.Adapted from Hong, J. et al. (2015) Cell Death Dis. 6, e1832. with permission of Nature Publishing Group. Anti-Dopamine Transporter (DAT) (extracellular) Antibody (#AMT-003) is a highly specific antibody directed against an epitope of the rat protein. The antibody can be used in western blot, immunohistochemistry, and live cell imaging applications. It has been designed to recognize DAT from mouse and rat samples. The antibody is unlikely to recognize DAT from human samples. Hong, J. et al. (2015) Cell Death Dis. 6, e1832. Mouse coronal brain sections (1:200).